We just received our Thank You notes from Ms. F’s class for sponsorship of a project through Donor’s Choose. “I teach an amazing group of second graders in a Title 1 school in New York. Our class has a vintage sock monkey collection and my students absolutely love them! We posed in our class picture with our monkeys! They are a big part of our class identity. Ron Warren is the world’s biggest sock monkey collector. He has over 2,000 sock monkeys. Arne Svenson is a photographer who is photographing Ron’s sock monkeys. They are going to visit my class in the spring. I would love for each of my students to be able to have a copy of Ron and Arne’s book, Sock Monkey. 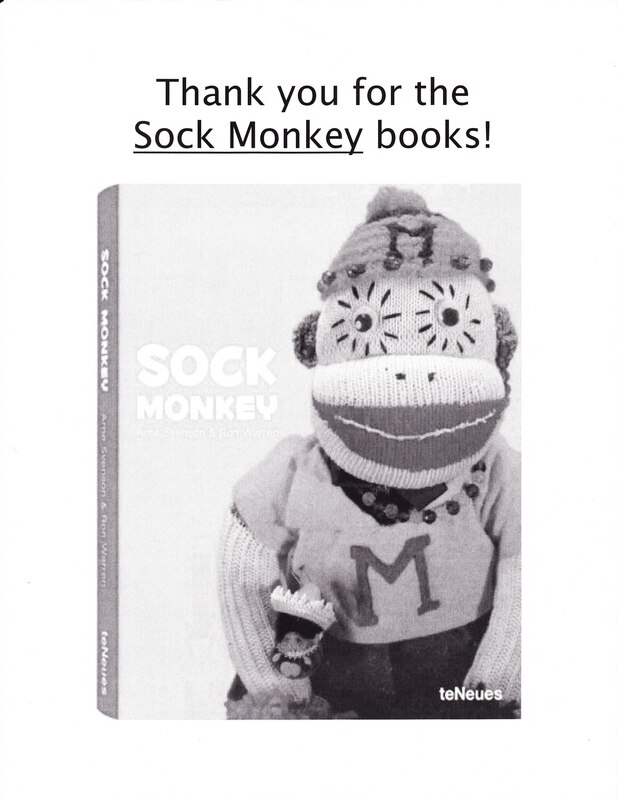 It is a photography book that highlights some of Ron’s favorite sock monkeys. We love looking at it in class. I know that the book would be a memorable keepsake of a once in a lifetime visit. The book will also be a reminder of the time that they spent together in second grade. Your donation will ensure that my students will be able to have a book that they will cherish forever. My students need 22 copies of the book “Sock Monkey” by Ron Warren and Arne Svenson. Thank you immensely for your generous donation. My students will adore their sock monkey books! Sock monkeys have played a big role in our classroom and this particular book is a huge hit in our room. I know that they will always cherish this book as a reminder of our class as well as a reminder of the incredibly enriching visit from the man with the world’s largest sock monkey collection and the photographer who photographs the monkeys. Our sock monkeys have provided a lot of levity and laughs. Thank you so much for donating these books to my class. They were beyond overjoyed when I told them that we had been funded. Thank you for understanding the role that classroom community and fun plays in the classroom. Your kindness is extremely appreciated. I know that my students are going to adore looking through this book to find their favorite sock monkeys. I hope it is something that they carry with them into adulthood as a way to remember second grade. Thank you for your very generous donation and thank you for putting a smile on my students’ faces. This book will add lots of smiles and levity to their lives. Donors like you are my heroes. Once again, thank you for bringing joy to my class. 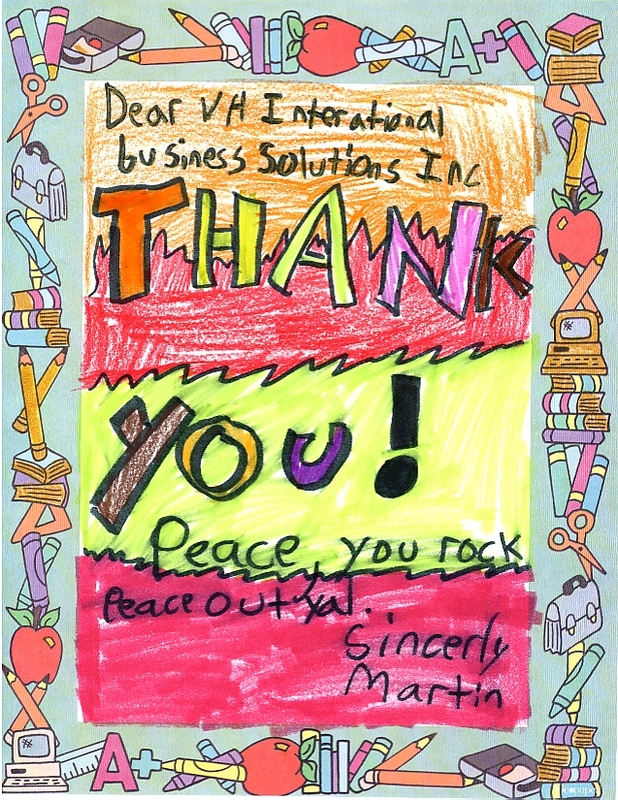 We just received our Thank You notes from Ms. R’s class for sponsorship of a project through Donor’s Choose. Project: Our Books Desire a Home! “I teach English to 8th grade students in an extremely urban area. We strive to culturally diverse and draw students who desire to become scholars, activists, and creators. As a charter school, we are limited in our funding and, unfortunately, have few classroom supplies and materials. This past year, my students and I have been working to create a classroom library with books that attract adolescents. We have searched through second-hand bookstores and $1 library sales to find as many age-appropriate novels as possible. Unfortunately, we currently do not have a place in our classroom to house the fruits of our labor. My students and I are asking for bookshelf so that our books will have a designated and accessible area in our classroom. Your donation will help ensure my students that their hard work this year had a reason. Although many will be graduating in a few weeks, they understand the importance of leaving a legacy for the upcoming eighth graders. This could be their legacy! What a wonderful surprise to know that there are people in this world dedicated to helping improve the education of students they do not personally know. Your donation has made it possible for my students to have an actual, working library in our classroom. I am so excited to know that the novels will finally be able to be classified by genre and be on display for all students to access. Thank you for you support. I hope you continue to visit this website and see the many worthwhile projects posted by teachers. Words cannot express how amazed we are that total strangers are invested in our education. As a California charter school, we are currently facing extreme budget cuts. Donations, now more than ever, help supplement and enrich the learning of all my students. Through donorschoose.org, we have received numerous supplies including novels, personal whiteboards, hardcover blank books for student-created storybooks, a LCD projector, and art supplies. This September, I was pleased to find out that my “Give-back Birthday” site received the third highest amount in donations. I am still overwhelmed by how giving generous donors, such as yourself, can be. More specifically, thank you for the bookshelf to house our novels. My students love being able to quickly find novels they are interested in because the books are finally organized by genre. Moreover, I’ve noticed an increase in the amount of students staying after school and simply “hanging out” in my bean bag corner. In reality, they are actually choosing from a variety of our novels and reading! On a more personal level, I have also seen many of my past students coming back to my classroom this year to talk about their experiences in high school. This past week, a past student came in and requested a recommendation for a novel to read. After handing him my most recent Dan Brown, he flopped down on a bean bag and read for over an hour. This coming from a student who hated reading while in my classroom! Again, thank you for your donation. I hope you continue to visit this superb website and consider donating to the many worthwhile projects posted.